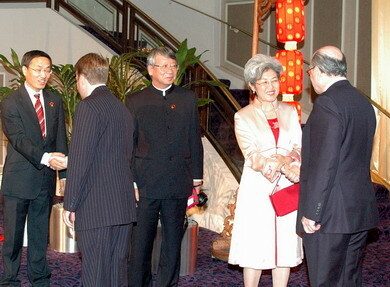 On the evening of 24 September 2009, a grand reception celebrating the 60th anniversary of the founding of the People's Republic of China was hosted by the Chinese Embassy in UK at the Marriot Grosvenor House Hotel London. The hotel was located in a busy street and packed by attendants. There were over 1,200 attendants including First Secretary of State and Secretary of State for Business, Innovation and Skills Rt. Hon. Lord Mandelson, Home Secretary Rt Hon Alan Johnson MP, other secretaries of state from different departments, shadow secretaries and state secretaries from the Conservative Party, former Deputy Prime Minister Rt Hon John Prescott, heads of multinational companies and representatives from the government, parliament, political parties, businesses, media, academia, overseas Chinese, Chinese exchange students and Chinese institutions resident in UK. The reception was shining with glamorous lightening. 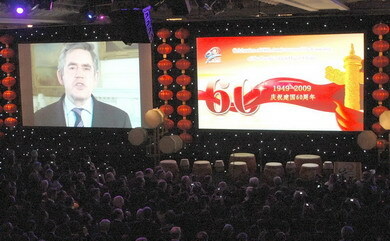 On the broad screen over the central stage was an eye-catching line "Celebrate the 60th Anniversary of the Funding of PRC" in both languages in red and yellow. Decorating in between were 60 red lanterns, ebullient with a happy holiday air. Greens and flowers were echoing the national flags of the two countries. Up-down from the ceiling were five huge colored and black-and-white photos, reflecting changes in people's lives between the 1970's and the 21st century and reminding the audience of all the unforgettable moments in the 30 years of reform. 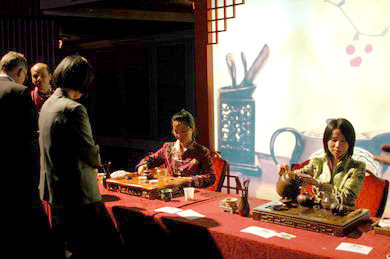 There were also exhibitions, such as the photo show demonstrating China's development on all fronts and the cultural life of its people, China-UK stamp show, demonstrations of Chinese culture, tea art and calligraphy, promotion pictures of the Shanghai World Expo. All this appealed so much to the audience that they were even unwilling to leave. The four touch-screen machines for Chinese learning kindly contributed by the Chinese Language Council International attracted the eyeballs of many as well. The reception began at around 7 pm when three Chinese female singers and one British male singer sang national anthems of the two countries respectively. This was followed by Prime Minister Brown's video message. The PM extended his best wishes to the Chinese Government and people, and the Chinese community living in UK. He said, China has managed to get rid of poverty within a short space of time since 1970's. This has not only affected 20% of the world population, but has had a far reaching significance for mankind as a whole. While in history many important inventions came from China, China is now one of the major forces behind world economic growth. Today's China is once again a world power and plays a major role in the world economy. Its continuous prosperity, stability and success is in the interest of UK. With more frequent dialogue and closer cooperation at the policy level, the two countries are enjoying best-ever bilateral relationship. The UK is ready to work closely with China to facilitate continuous growth of China-UK relationship and enhance mutual understanding and cooperation. 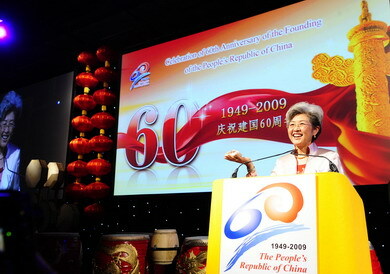 In her vivid and passionate speech, Ambassador Fu Ying spoke of the historic changes that have taken place in China. She highlighted, in particular, the splendid success that China had achieved in its exploration of a China-specific development path in the past thirty years of reform. She quoted personal stories of life changes from some Chinese bloggers. She even talked of the food coupons that her mother had wrapped up in handkerchiefs. All this shows that the Chinese are happy and proud to be rid of poverty and march towards a life of moderate prosperity. Fu said, although reform remains a long and hard journey, we are confident of making China a country of harmony and stability, where people are educated, earn their own living through labour, can access proper health care service and old-age service, and are provided with comfortable sheltering. Fu Ying said, we are deeply aware that now that China is on the world stage, its measures, views and every success are closely linked to the world. Likewise, the development of the world has always had its impact on China. We will take seriously our international responsibilities endowed upon by the times and make our contribution to the world harmony and development. Home Affairs Secretary Johnson spoke on behalf of the British Government. He began by extending his congratulations on the 60th anniversary of the founding of New China and wishing for its prosperity. He said, since reform, China has contributed to the world economy more than any single country and will become a predominant economy and an important force in the world while assuming greater responsibilities. He applauded and welcomed President Hu Jintao's speech at the UN summit on climate change and believed that that would help push for the process of the Copenhagen Conference on Climate Change. Johnson said that there had been extensive cooperation between the two countries and bilateral relationship will enjoy a broad prospect. He also thanked the Chinese community here for their contribution to the economic and social development of UK over the years and committed to provide convenience for Chinese traveller, students and investors that are interested in coming to UK. Performance was opened amidst the happy drum-beating of Red Poppy Ladies Percussion troupe. Their marvellous expertise and energetic dancing demonstrate the dynamism of the younger generation. 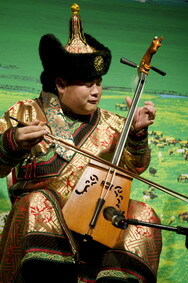 Immediately when the drumbeating stopped, light was casted upon the Mongolian fiddle. With the ingenuity of Mailasu, an artist from Inner Mongolia, the gentleness of the tune seemed to have extended far into the vast grassland. 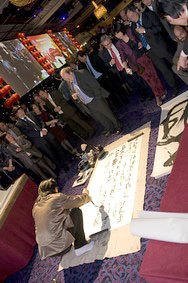 Audience were all captured by the unique charisma of Mongolian culture. Once again with the drum beat, the reception was elevated to its peak. 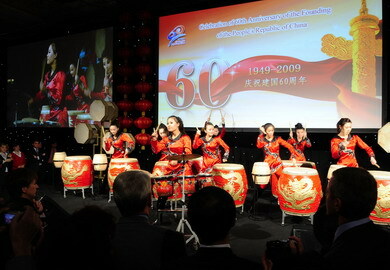 The attendants extended their congratulations on the 60th anniversary of the New China and applauded China's success. Many were impressed by the "food coupon" example that Ambassador Fu Ying mentioned in her speech and believed that this small story was in itself a convincing proof of how reform has generated tangible benefits to the Chinese people. They also spoke of China's achievements in social and cultural development along with its economic growth and the increasing candidness, openness and confidence of the Government and its people. They saw China enjoying a higher international status and playing a responsible role in responding to global challenges such as the international financial crisis and climate change. China's development is a blessing rather than a threat to the world. They hoped to see greater achievements in the future. Many spoke highly of President Hu Jintao's recent remarks at the UN podium and expressed their readiness to contribute to the further growth of China-UK relationship. 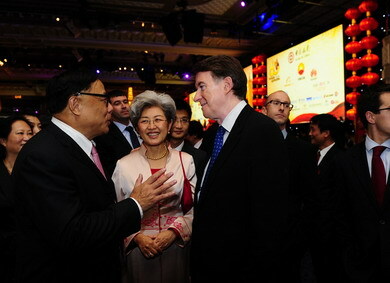 In the joint interview with CCTV, Xinhua News Agency and Phoenix TV, Lord Mandelson extended his congratulations. He said, a growing and stronger China is in the interest of the world as well as itself. China's active engagement in the G20 Summit can enable a more effective global response to the financial crisis and facilitate more balanced growth of the global economy. Relations between the two countries are enjoying a good momentum with increasing common interests. The UK sees China as an important partner and hopes to see it playing a bigger role globally. 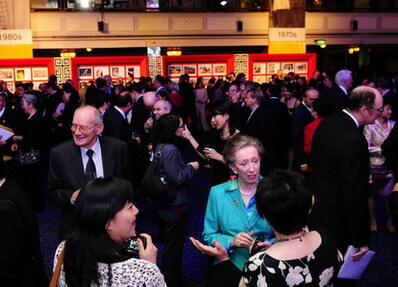 Lord Clement Jones, Vice Chairman of the All Party China Group, said, the reception has gathered all the British in London who understand China. Everyone is happy about China's development and is thinking about how to bring the two countries even closer. Representatives of the Chinese community and students said that the unprecedented size and level of the reception itself had testified to the power and appeal of the motherland. As overseas Chinese, they all feel happy and proud. They are committed to play their active part in China's modernization drive, the preservation of national reunification and the great rejuvenation of the Chinese nation. The reception was highly appraised by the attendants. Its original design and graceful style fully demonstrated China's development process, embodying both the long history of the Chinese culture and the diversity and dynamism of a modern China. Ambassador Fu Ying received a special interview of BBC and collective interview of Chinese media in London.